At the heart of the Norfolk Coast you’ll find the Norfolk Coastal Path, stretching from Hunstanton in the West to Cromer in the East. It offers an ideal way to explore the natural beauty of out coastline, taking in salt marshes, working harbours and miles of sand dunes. 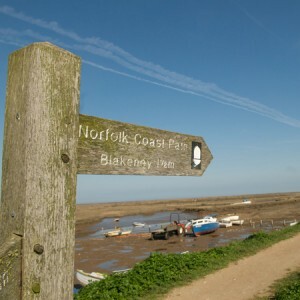 Another alternative is the Norfolk Trails network offering shorter, circular walks which incorporate the coastal path. They range from 4 1/2 miles to 9 1/2 miles. See here for more details. Below we share some of our favourite, easy to find walks. Starting from the beach car park, this walk gives you the best of both worlds. Take the time to explore the beach and dunes, then head back through the pinewoods for some wildlife spotting along the way. If you don’t fancy the walk back head south up Lady Anne’s Drive to Holkham for a drink at the Victoria and catch the Coasthopper bus back to Wells, then hop on the light railway back down to the car park. 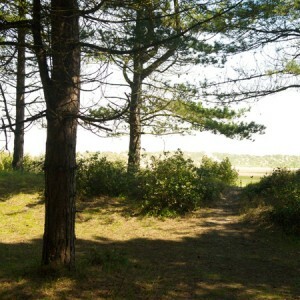 If you are feeling up to it you can take the Wells to Holkham walk then continue onwards to Overy. Alternatively start at Lady Ann’s car park in Holkham and head directly out onto the beach following the dunes to your left. Continue to walk west passing the mounds of Gun Hill. Keep your eye open for an opening in the dunes that will take you south to join the bank that will take you above the marshland, past the creeks, down to Overy Staithe. Feeling tired? Catch the Coasthopper back! This gentle walk gives you plenty of opportunity to stop, sit down and enjoy the sea air. You will find the car park at the bottom of the beach road, but watch this road during high tides as it is liable to flooding. As you walk along the shoreline keep an eye out for the old wreck that sits out in the water. This used to be used for target practice by the RAF before sinking in 1944. Park up at Weybourne car park or walk down by the village shop after stepping off the Coasthopper bus. From here leave the salt marshes and golden sands behind and pick up a line of high cliffs that will give you some great views over the North Sea. Take the path leading you up onto the cliff tops for 2.5 miles until you reach the town of Sheringham. If you have some good shoes, why not head back along the pebbly shore on the way back, or head into town to the train station to catch the Coasthopper bus back. Back in 1968 a large part of undeveloped coastal landscape stretching from Old Hunstanton to Bacton was designated as an Area of Outstanding Natural Beauty in order to protect the varied landscape and wildlife that makes it their home. In order not to disturb the local habitats and help us to keep our coastline special please stick to the Countryside Code.